Since playing for rescue workers at Ground Zero following the September 11th attacks, From the Top alum William Harvey has made it his life’s mission to bridge cultures and promote peace through music. As one of the first young musicians to ever appear on From the Top back in 1999, we reconnected with William during our 10th anniversary season in 2009 to learn about the non-profit he founded, Cultures in Harmony. It turns out we caught him at the beginning of an amazing new journey…he revealed to us then that he was going to move to Kabul to be a violin teacher at the Afghanistan National Institute of Music. Was he crazy to move to a country that had for much of the past twenty years banned music? Fast forward three years, William is one of seven Western teachers at the institute, which teaches 150 students, half of whom have grown up on the streets. Significantly, in a country where access to education is difficult for women, there are 35 female music students. 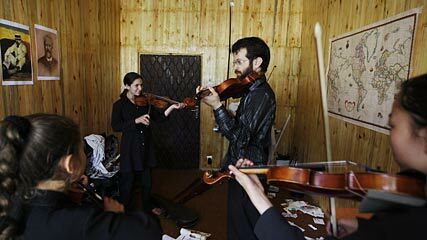 In addition to teaching private violin lessons, William is also the conductor of the Afghan Youth Orchestra. This February, he and his colleagues brought 48 Afghan students to the United States for the first time. “It’s the responsibility of a musician to defend the right of human beings everywhere to be musical and to express themselves through music. We’re celebrating a victory: the return of music,” William told The New York Times. William and his colleagues from the Afghanistan National Institute of Music performed at the Kennedy Center (February 7), Carnegie Hall (February 12), and New England Conservatory (February 14). Watch a segment on the Afghanistan National Institute of Music on the Today show.